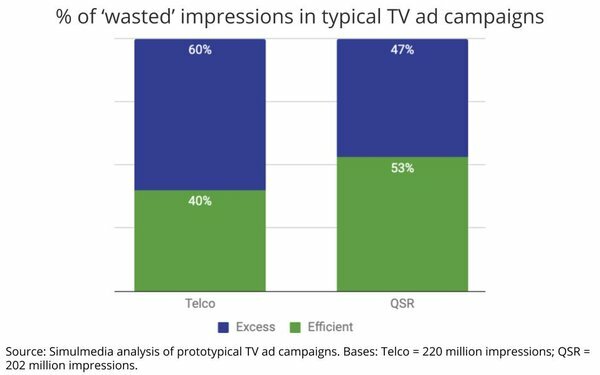 The analysis, which examined two actual campaigns by major national advertisers -- one in the telecommunications category and the other a quick-serve restaurant chain -- found that high percentages of the their impressions were “excess,” meaning they were reaching the wrong viewers or viewers who had already been exposed to the ads an optimal number of times. In the case of the telecommunications marketers, 60% of its audience impressions were “excess,” while 47% of the QSR marketers were. “What we found was astounding,” Matt Collins, senior vice president of marketing at Simulmedia said during the presentation with CBS Chief Research & Analytics Officer Radha Subramanyam. The reason for the waste, they said, was that the campaign’s delivered “excess” frequency by using the wrong mix of network ad impressions based on archaic demographic segmentation. “Are we willing to walk away from six in ten Americans?” Subramanyam chided, noting that only 43% of the U.S. population even falls into the covered 18- to-49-year-old demographic that is the basis for TV targeting campaigns like the ones cited by Simulmedia’s analysis. While CBS has long groused about Madison Avenue’s obsession with that demo, or even demographic targeting altogether, the industry lacked the tools to segment the “strategic” targets many brands are actually seeking to reach until now, Subramanyam said. She made the obligatory pitch for including more broadcast networks in national TV campaigns, because of their greater reach, but also implied that utilizing more sophisticated audience optimization systems can reduce excess frequency. She acknowledged that many variables -- target, brand category, creative, etc. -- are factors, but that a good rule of thumb for effective frequency was no more than “seven to ten” impressions per viewer. Beyond that, she implied, campaign impresses are simply wasted. 13 comments about "Wasted: Audience-Based Data Shows Half Of TV Campaign Impressions Are 'Excess'". Douglas Ferguson from College of Charleston, April 11, 2019 at 8:41 a.m.
15 minutes could save you 15% or more on car insurance. But maybe you've seen that ad. Long Ellis from Longview Media Consulting, April 11, 2019 at 11:40 a.m.
Every time a TV network that sells strict daypart mixes asks an advertiser to increase their spending, what they are really asking is if they are okay with too much frequency and an opportunity to increase their cost per reach point. How long will this be sustainable........?? Doug Garnett from Protonik, LLC, April 11, 2019 at 1:32 p.m. This is pretty silly. And it's sad to see that CBS is behind it — although it's probably motivated by desperation to sell ineffective time on their streaming network. Chris Tinkham from Devito/Verdi, April 12, 2019 at 9:37 a.m.
Would be nice if "typical" was defined. And maybe add a time continuum to the discussion..... QSR and Telco weight levels, continuity and spending might not be the "typical" of most advertisers. Jonathan Latzer from MarketJon, April 12, 2019 at 9:49 a.m.
"50% of my ads are wasted. I just wish I knew which half". Where have we heard this before? dorothy higgins from Mediabrands WW, April 12, 2019 at 10:09 a.m.
Do you get kickbacks from Simulmedia? Asking for a friend. This “report” belongs in the 1980s media archives. Joe Mandese from MediaPost, April 12, 2019 at 10:43 a.m.
@Dorothy Higgins: Who is your firend? To answer your question explicitly: No, I don't get kickbacks from Simulmedia or from anyone in the industry, including Mediabrands, which I've written about thousands of times, including several Agency of the Year Awards citations. By comparison, I've written 49 stories about Simulmedia since it was launched in 2009, and many of them involved presentations they've hosted, including this one. We cover them because we think the information they present is credible and relevant to our readers. Re. your comment about that this "'report' belongs in the 1980s media archives," I actually began covering media planning, buying and research in the 1980s and recall similar debates about effective reach and frequency, and the sad truth is that I don't believe the conversation has advanced much further, especially among agencies like Mediabrands', despite the advent of optimizers, marketing mix modeling, attribution models, etc. I'm not sure why you object to me reporting on other points of view about it, but perhaps it struck a nerve? Since you seem so interested in frequency, I ran a “Mandese” byline search to see how it indexes against keywords on MediaPost. I included Interpublic (21,960 bylines), and Mediabrands (6,660) and compared it with Simulmedia (49) and comparable companies listed as “demand-side facilitation" in Luma Partners’ convergent TV Lumascape, including Google (22,210), Comcast (3,422). PJ Lehrer from NYU, April 12, 2019 at 11:09 a.m. There is no doubt in my mind that most brands are overdoing frequency. I suspect it has something to do with not adjusting the r/f curves to account for binge watching. But, it is also the unfortunate outcome of what happens when we let computers think for us. Back in the 80's after we did computer runs we manually adjusted the outcome to account for undelivery in certain regions. I don't think anyone is doing that anymore. Moreover companies are not even doing cumulative r/f's which would show them the effects of the totality of their multiple campaigns, and certainly indicate that they are way over eight exposures; and therefore have achieved wear-out. It's not rocket science but it does need a human touch. Jack Wakshlag from Media Strategy, Research & Analytics replied, April 12, 2019 at 12:13 p.m.
Well done Joe. In terms of substance, the results here are what was shown by Turner’s Media at the Millenium studies almost two decades ago. It was well covered by you and others. The largest advertisers, who were represented by the largest agencies, spent the most on broadcast, and paid for it with huge cost per reach points. Turner demonstrated that advertisers could reduce their cost per reach point by shifting money to (of course) cable tv. Self serving, yes. But true nonetheless. Advertisers were not happy with what was shown and agencies were rightly taken to task. Those studies led to a shift of dollars from broadcast to cable in a “one TV world.” I agree with you that little progress has been made despite the emergence of optimizers. Why? Wish I knew. Long Ellis from Longview Media Consulting replied, April 12, 2019 at 3:08 p.m. The reason we have not made any progress is that the national TV networks continue to use legacy trading practices and that is a lot easier than recognizing the significant issues that are bringing them down and developeing a solid plan B. Most of what I see coming are more targeted campaigns, which will only result in lower TV spend and more frequency against a smaller pool of potential customers. IMHO- The biggest impediment to innovation is the status quo and the people who are protecting it. There are some innovators out there, however, and this will get fixed by a new way of trading that represents a win/win for TV nets and advertisers. Ed Papazian from Media Dynamics Inc, April 15, 2019 at 4:41 p.m. This sounds like a reprise of the old "effective frequency" theory of the 1970s---whch has some good points in cases where it applies but is very hard to execute. For, example, the theory stated that reaching a consumer once per month was ineffective and that doing so more than six times was probably wasteful. Hence media planners sought to optimize their TV schedules at the 2-6 frequency level. Fine, but there is no data that tells us how often a viewer "watches " a TV commercial. All that we know is that the set was tuned in when the ad appeared on the screen. In reality, a person who is credited with "seeing" an ad 10 times per month-----or less effectively due to redundency----probably watches it only 5 times, hence "effectively". Effective frequency is difficult to utilize as a TV time buying tool, especially in the upfront where many of the shows you buy into don't even exist as yet and "corporate buying" does not allow for finely tuned targeting. However, effective frequency can be used by client media directors when allocating their corporate media buys to individual brands----providing adjustments are made to account for actual commercial exposure opportunities. Dave Morgan from Simulmedia replied, April 15, 2019 at 8:49 p.m. I'm glad that so many are commenting on this, and wondering what is new. The point of the research that we did with CBS wasn't just to show that many TV campaigns deliver way too much reach, but that to show that it was a solvable problem. Simply put, how you buy TV matters. It mattered in the 1980's when Erwin Ephron called wasted frequency the "crab grass" of ad spend, and it still matters today. Buying TV doesn't have to mean wasted frequency, but buying it blindly is likely to result in it. Jack Wakshlag from Media Strategy, Research & Analytics, April 15, 2019 at 9:13 p.m. Product purchase data is great if it is good data (often not as good as it seems) But we don’t need to be more sophisticated than demos to solve the frequency problem. Optimizers used demo data and solved this pretty well without product purchase data. Expensive and excessive frequency is normally seen among advertisers who place large shares of their budget on too few networks — and the increased reach of any one or combination of broadcast networks fades quickly. Take the last 20% of GRPs from broadcast buys and place them elsewhere (cable, online, radio pretty much anywhere) and your cost per reach point will be lower and your reach higher.